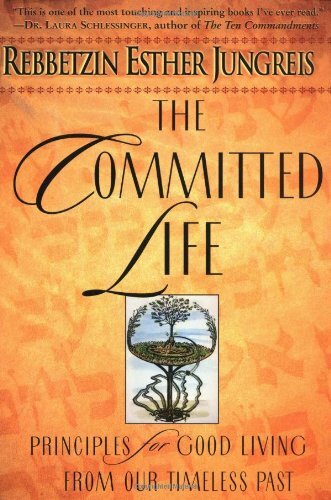 Expert Review of The Committed Life: Principles for Good Living from Our Timeless Past by Esther Jungreis, one of our picks of the top Jewish books for kids! Jungreis warns us in her introduction that our generation lacks moral underpinnings, values, and role models, that our homes lack stability and serenity, that our families have become dysfunctional, and that our world is high on bitterness and low on kindness and generosity. The author's father was the chief Orthodox rabbi of Szeged, Hungary, and when the Nazis occupied that city during World War II, the family was taken to Bergen-Belsen concentration camp. In the form of stories based on real-life incidents--including this harrowing family event--Jungreis advises readers on such weighty matters as commitment, responsibility, charity, peace, prayer, forgiveness, banishing fear, compassion, faith, hope, and gratitude. An inspired and inspiring book.